The Parisien Jean-Eric Vergne wins the Paris ePrix, the eighth round of the 2017-2018 FIA Formula E Championship. The driver of the #25 Techeetah car clinched his third win of the season and the fourth in a career after starting from pole in his home town. 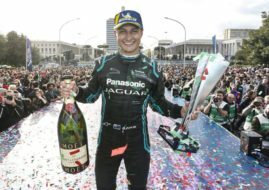 He wins ahead of reigning champion Lucas Di Grassi (Audi Sport Abt Schaeffler), who finished in the second place for the third race in a row. Di Grassi reached P2 on the last lap after Andre Lotterer (Techeetah) stayed without power and slowed down. Sam Bird (DS Virgin Racing) hit Lotterer’s car but he managed to finish third, ahead of Maro Engel (Venturi) and Sebastien Buemi (Renault e-dams). Lotterer finished sixth after all. Other point-scorers are Daniel Abt (Audi), Felix Rosenqvist (Mahindra), Oliver Turvey (NIO) and Jose Maria Lopez (Dragon Racing). The next race is the Berlin ePrix at Tempelhof Airport Street Circuit, scheduled for May 19.